They say that if there is one thing a woman should not forget to have before leaving the house, it should be a LIPSTICK! (Or just a lip color I guess?) Why? Because putting on some colors to your lips can make a whole lot of difference. Having a bad hair day, bad outfit, or even bad mood can be pass by, but having a pale face cannot save you from a day of misery! I completely agree to this thought but I am not completely convinced. Haha. It's ironic how things can come like this but that's how it used to be for me. I tend to pass each day without makeup on, that is why most of my Instagram photos are tag with #nomakeup hashtag. But that doesn't mean I don't have even one lip product in my bag when I leave the house. I tend to bring not just one, or two, but 12 lip products to be exact! That's how weird I am! Bringing those stuffs every single day without an assurance that I will use even one of them! But when it comes to a lip product must-have, this one I am having a review today is one on my list. 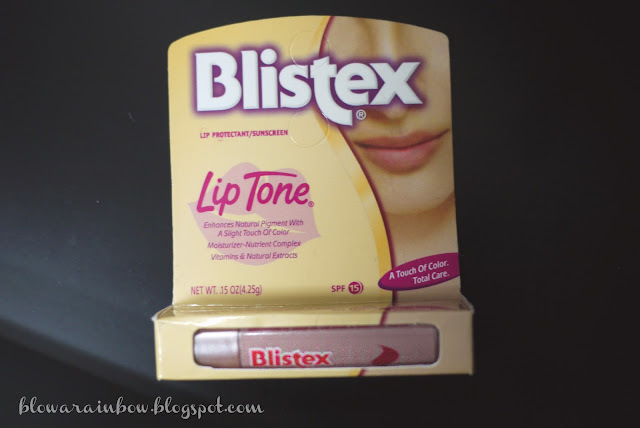 Blistex Lip Tone is a 3-in-1 product that would make each girl's life easier. If you are like me who thinks that wearing a lipstick is just for big occasions/celebrations and not for everyday use, then this product is right for you! Blistex has been introduced to me by my boyfriend's sister, ate Len (her blog is happy-whenever.blogspot.com). It is a lip moisturizer, lip protectant and lip tone in one! It enhances the natural pigment of your lips with a slight touch of color. Imagine wearing a lip color without everyone noticing that you're not! By the way, I bought mine at Mercury Drugstore. Ate Len told me that this is also available at Watsons. Visit www.blistex.com for more details. maybe I can find it here too! Sounds great! Guess its worth a try. I seriously just recently posted about how amazing Blistex is, along with a few of my other favorite things. It's funny that you remember who introduced you to it, as I do too. The girl had amazing lips, and when she told me she wasn't wearing anything I was in need of her secret! My cracked chapped lips healed completely 3 days later with Blistex Lip Medex. Im now so curious about this liptone..hmmm how much it cost?.. Which is better, Blistex or Burt’s Bees?